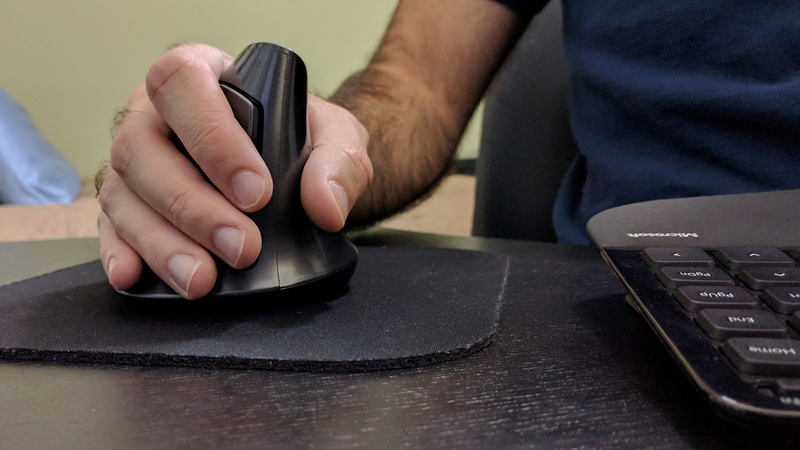 By Daniel Falconer on March 15, 2018 at 1:12 a.m.
As it turns out, a traditional computer mouse may not apply good ergonomics. Sit up straight with your feet flat on the ground. Get a chair with good lumbar support. Adjust your monitor so that the top of it is as eye level. You've likely heard one or more of these kinds of tips for sitting at a desk and using a computer. They're all talked about in reference to computer ergonomics. UC Berkeley defines ergonomics as "the science of fitting jobs to people." And so by extension, it could be said that a major aspect of computer ergonomics is determining the best desk setup and computer accessories for people to use so that the experience is more natural. As it turns out, a traditional computer mouse may not apply good ergonomics. I want you to do a little experiment to realize it. First, rest your hand and arm by your side. Take note of how it feels, and the orientation of your forearm in particular. Now move your arm into position as if you were using a mouse. Do you know what is happening inside your arm? Put your other hand around your arm to feel the change. The bones in your arm twisted, and the muscles tightened in order to do so. 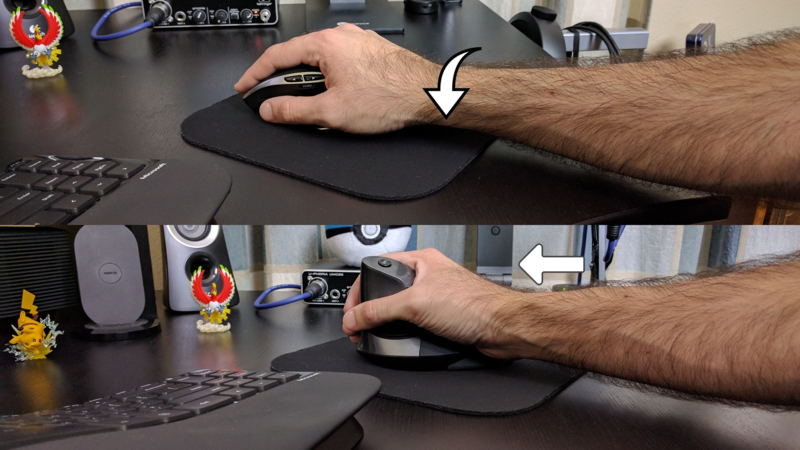 The orientation of our arm when using a mouse isn't even close to a natural resting position. Putting your body into unnatural positions for long periods of time can cause physical strain, or even injury. Do as I say, not as I do. I've yet to see a doctor about my joint issues. My problem is likely two fold. First, when using a traditional mouse I don't use the proper technique; moving primarily with your shoulder and elbow. I'll move my wrist side to side, and plant my wrist to use only my fingers. While this level of control is great for precise production work or playing first person shooters, it's also a fast track to a repetitive motion injury like carpal tunnel syndrome. Additionally, joint problems run in my family, specifically rheumatoid arthritis. That is very likely not doing me any favors. As a result of these factors I'm not able to use a traditional mouse for long periods of time. So I started usng a vertical mouse. The first vertical mouse I tried was from Anker. The shark fin design of it is certainly foreign, even for a vertical mouse. Once you wrap your hand around it though it makes sense. If you were to imitate a claw with your hand it essentially fills the void between your four fingers and thumb. It took no more than a week to retrain my brain on how to use this kind of mouse. With the three primary buttons on a traditional mouse you push down in order to click them and that's it. When it comes to a vertical mouse however you're applying a horizontal force. You no longer have the surface your mouse is on to push back and keep the mouse in place. Depending on the weight and design of a vertical mouse, you may need to be the force that holds the mouse steady when you click. This is the case with Anker's mouse. At only 95 grams (without batteries) this mouse is very light. When clicking the buttons on this mouse you'll need to kind of pinch it, or apply a similar amount of force with your thumb. The left and right buttons don't require any more force to activate than they would on most other mice. So, the oppositional force doesn't need to be more than that, which is so say, very little. Still, it's something that needs to be considered. A welcome tweak to the otherwise standard buttons on this mouse is the tilt activation of the scroll wheel button. On your typical mouse the scroll wheel button requires more force to press than the left and right buttons. That's still the case here on Anker's mouse and, due to the horizontal forces previously mentioned, that's undesirable. Thankfully, the middle button click can be activated by tilting the scroll wheel upward. Pushing up on the scroll wheel with my middle finger is simple and easy. My only complaint with this mouse, aside from the light weight, is the fact that the DPI resets when the mouse is turned off and on again. Its normal price of $20 (although it can sometimes be had for less on Amazon) is perfectly reasonable for a wireless mouse and you won't feel too bad about spending the money if you end up not liking it. If you want dip your toes into vertical mice, this is a good one to start with. Anker has a second, newer vertical mouse on offer. It adds a lip to help keep your pinky finger from dragging; a complaint from many on the first design. The DPI button also moved to below the mouse wheel so that it's less likely to be hit by accident. It's slightly heavier, 127 grams without batteries, but still relatively light. With the shark fin gone, this mouse looks more like a traditional mouse turned on its side. And while the footprint is still similar, it feels much smaller in the hand. This change was very significant for me. I found it very easy for my hand to float up the mouse, and ended up holding it essentially like a traditional mouse. My muscle memory kicked in and I started to move my wrist side to side. I stopped using this mouse the day I got it, and would not recommend it to anyone. The next vertical mouse I tested is from J-Tech Digital. 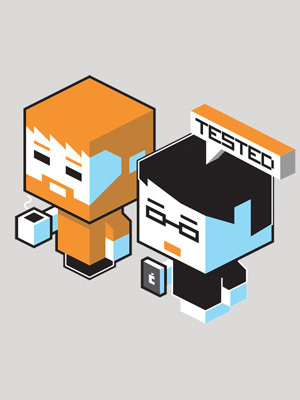 Its design is like a fusion of a mouse and a joystick. My average sized hand comfortably wraps around it like your hand would around any curved object, as that's how our hands naturally move. Build quality is solid and is made out of both a standard plastic and a soft plastic/hard rubber for the thumb, palm, and palm rest area to provide a texture for better grip. The palm rest is removable, but I don't know why someone would take it off. Two large mouse buttons are completely split by the scroll wheel. I find it slightly awkward to use the scroll wheel due to the size of the buttons and placement of the scroll wheel. It's almost as if you're meant to put your ring finger on the right button and leave your middle finger over the scroll wheel. While I thought this was worth pointing out, I think it's very minor. I very much like the placement of the backwards and forwards buttons on either side of the thumb. This way there's no mistake as to which of the two buttons I'm pressing. Overall this mouse feels great to use and is by far my favorite of the three I tested. The J-Tech vertical mouse runs for a little more than the Anker mouse, usually between $20 and $30 on Amazon. One thing to watch out for with these, and seemingly many, vertical mice are identical mice from different companies. This isn't a case of manufacturers creating clones or derivatives of an original company's design. 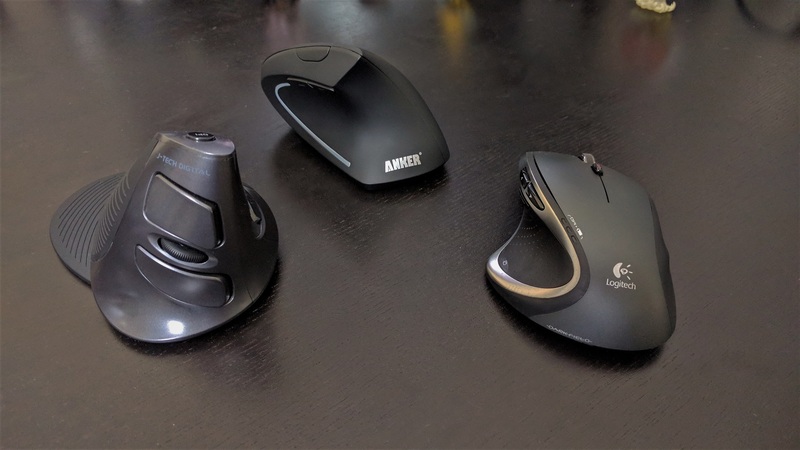 No, there are vertical mice that look identical even though they are from different companies. My guess is that there is an organization that holds the design patents to these vertical mice and then licenses them out to manufacturers. So if you're buying from Amazon be sure to check the reviews first, or at least reference them when buying elsewhere. 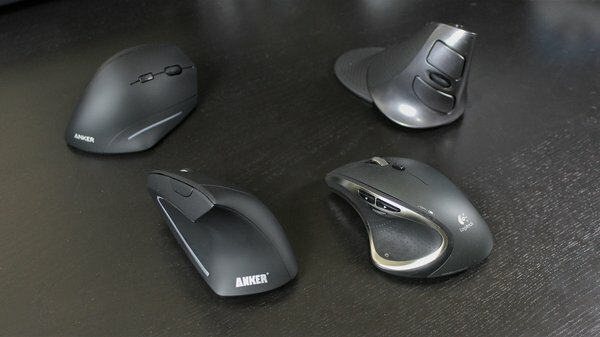 I'll also note that all of the mice I tested are, obviously, for those that are right handed. I was unable to find left handed versions of these models specifically, but there are left handed vertical mice out there for those that would prefer that. Once I became accustomed to using this type of mouse, using a computer day to day felt normal. Web browsing, file management, and the many other common things one does on a computer feel as they should. Gaming works as expected, for the most part. For a lot of indie titles, RPGs like Diablo or Skyrim, and even some shooters, a vertical mouse will serve you just as well as any other. When I play Overwatch I don't have any issues. I wouldn't recommend playing Widowmaker or Ana while using a vertical mouse, but I otherwise enjoyed the game all the same as I would with a traditional mouse. When it comes to competitive first person shooters however, you likely won't fair well. The problem stems from the technique used to control a mouse. 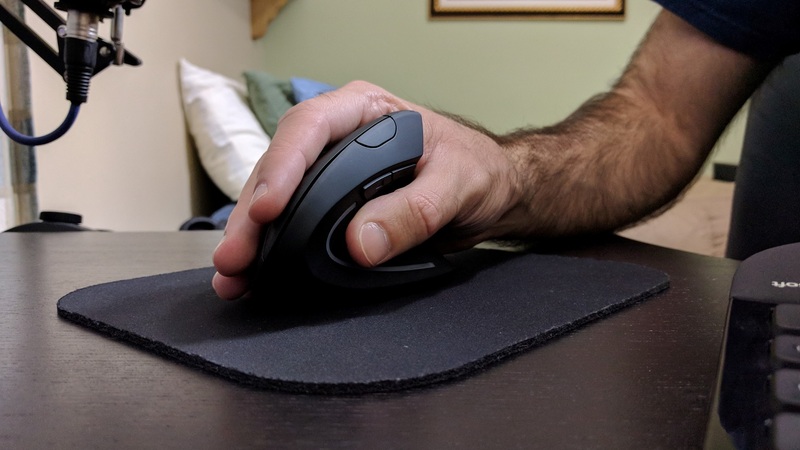 If you use any mouse as one technically should, you're moving it with your shoulder and elbow primarily. You're giving up fine motor controls for maintaining physical health. But, in my experience you need that fine motor control from your fingers and wrist in order to compete in multiplayer matches of Counter Strike and the like. That's not really feasible with a vertical mouse. You can't move your wrist side to side (relative to your wrist) or plant your wrist to use your fingers, especially with the J-Tech. It may be possible to raise mouse sensitivities to higher values in order to compensate, but that's not something I'm comfortable with. With a vertical mouse, I was giving up fine motor controls for maintaining physical health. Productivity tasks, such as editing in Premiere Pro or Photoshop, is more manageable compared to gaming. Editing videos is more or less the same process with a vertical mouse as it was with a traditional one for me. The only instance I find myself needing a finer level of control is adjusting audio levels and, more specifically, moving keyframes. Photoshop work more frequently requires fine movements. Thankfully, I'm able to adapt in these scenarios by utilizing the DPI button found on all the mice I tested. They all feature three different DPI settings, each of which vary slightly between models but not by much. With the DPI set to the highest setting of the three I then adjusted mouse cursor movement speed within Windows to where I like it (not too far off the default). Then when I need more precise movement, like in an Adobe program, all I need to do is hit the DPI button once to cycle down to the lowest setting and the cursor now moves significantly slower. When I'm done, two quick press of the DPI button has me back at full speed. I never put much thought into my physical health when I was younger. Which is weird, because I was constantly getting sick as a kid. But I suppose that's a result of the indestructible mentality many of us have when we're young. This isn't to say I consider myself old (sometimes), as I'm still in my 20s, though I've certainly become more conscious of my physical well being over the last couple of years. I'm relieved that I discovered vertical mice. Since I started using them the physical problems I experienced with a traditional mouse have noticeably diminished, or, if I'm having a good day, are a non issue. Having used computers for as long as I have, I don't believe it's possible for me to completely shake the muscle memory I developed for using a traditional mouse. 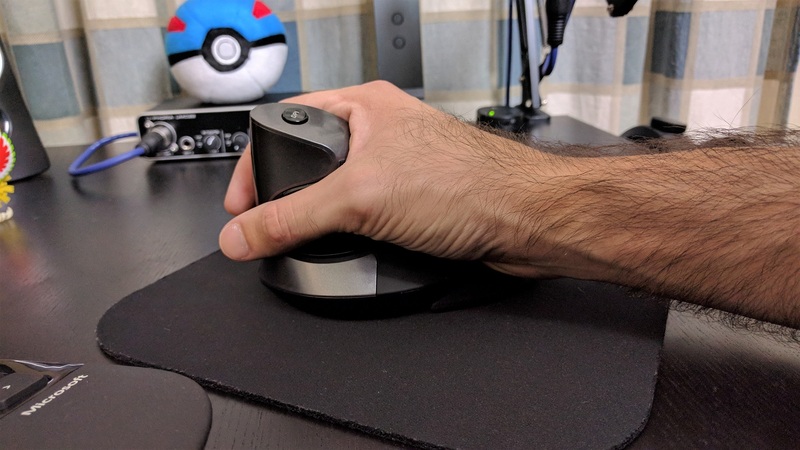 Aside from the benefits that likely come from your forearm being in a more natural position when using a vertical mouse, it's also just different enough that I needed to retrain my brain to use one. 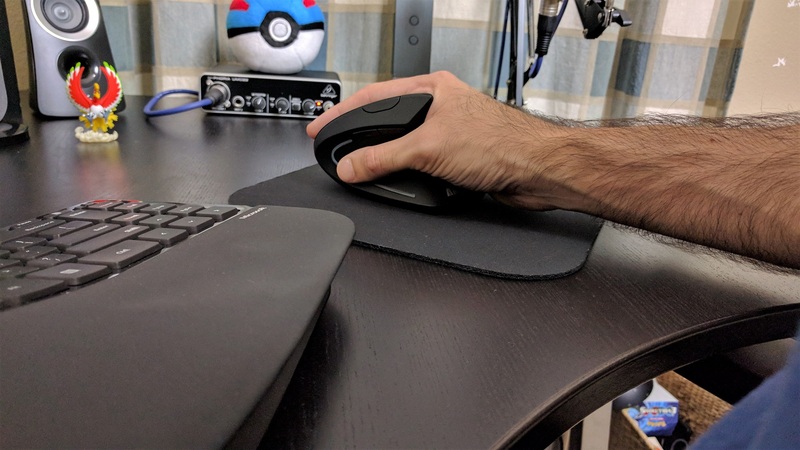 The design of vertical mice essentially forces you to move them with your shoulder and elbow, and thereby reduces your chances of developing a repetitive motion injury like carpal tunnel syndrome. So unless you're already a computer ergonomics master, I highly recommend trying out a vertical mouse. Personally, I'll never go back to a traditional mouse and will use vertical mice for the foreseeable future.